HOW TO NAVIGATE THIS POST: This article is divided into 7 pages. Links to each page are provided here and at the bottom of each. Mexico is undoubtedly one of the most popular destinations for U.S. visitors thanks to equal parts affordability, beauty, and ease of travel. 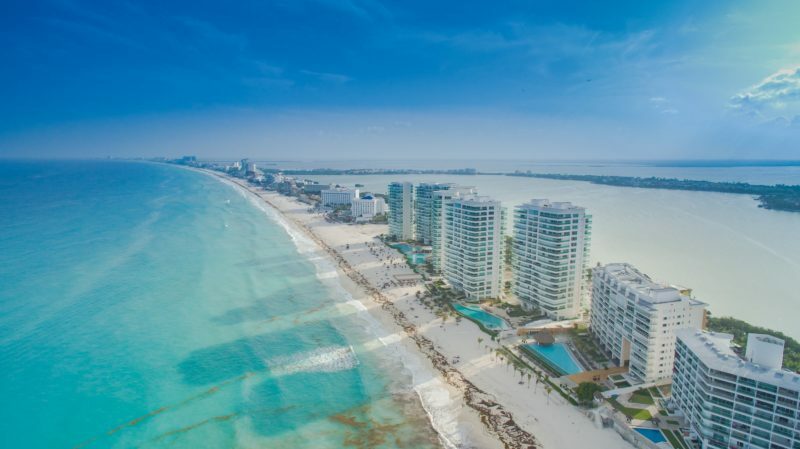 In the state of Quintana Roo, the Riviera Maya, a geographical stretch along the Caribbean coastline of Mexico’s Yucatan Peninsula, is especially popular for its beach-front cities and the vacation hot-spots of Cancun, Playa Del Carmen, Akumal, and Tulum. A short ferry ride from the coast will also bring you to the pristine islands of Cozumel and Isla Mujeres, which provide a similar, yet more relaxed experience to the land-based neighboring cities. Millions of international visitors lured by attractive all-inclusive packages (although rarely kosher) at all price points, travel to Mexico’s Yucatan Peninsula for a picture perfect vacation complete with powdery white sand and clear turquoise waters. You can only bring in cheese that says manufactured in the US (distributed in the US isn’t good enough). Nothing Made in Israel. You can’t bring in any beef and you can only bring in poultry that is cooked & sealed with a USDA seal. Homemade food items are prohibited. While it is possible they will not look at your bags in customs, if they do, they will confiscate your food. If you claim your food on the customs paper on the plane, & they take things away, they are required to freeze the food for you & you can pick it up on your way home. But you have to ask, they won’t offer. Additionally, it is NOT recommended to drink the tap water in the Cancun region, since it is not as clean for human consumption, but it is perfectly safe to make use of the water for your personal needs. The 3 major towns and neighboring islands each have something unique to offer; and traveling alone, with your partner, with friends, or with family will make all the difference for which Mexican beach destination is the perfect place for you.